By John Sloman, et al. 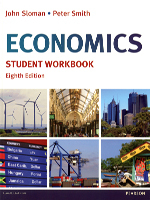 This comprehensive Economics Student Workbook is specifically designed to be used alongside the eighth edition of John Sloman, Alison Wride and Dean Garratt’s Economics. The workbook contains over 1500 questions of various types, carefully matched to the content of the main book. It is an invaluable guide for any student of economics, as well as a useful teaching aid for tutors.